I am in a rut….a side dish rut. We eat the same sides all the time: broccoli, asparagus, boiled potatoes, roasted potatoes with onions, caesar salad, etc. I really wanted to try something different so I decided to wing it. It turned out so well that when I called them “Smashed Garlic and Cheese Potatoes”, Will added “of Pure Awesomeness”. Sounds like a winner to me. This is more of an idea than a recipe but you’ll get the idea. Boil potatoes until tender (time varies depending on size). Preheat oven to 400 degrees. Spray 2 quart casserole dish with cooking spray. Place cooked potatoes in dish and smash with fork. Dot with butter and then sprinkle with garlic plus. Cover with shredded cheddar cheese to taste. Bake for about 15 minutes or until cheese is melty and starting to brown. Recipe Note: More butter and more cheese is better. Just sayin’. Ummm, holy crap. Yum. 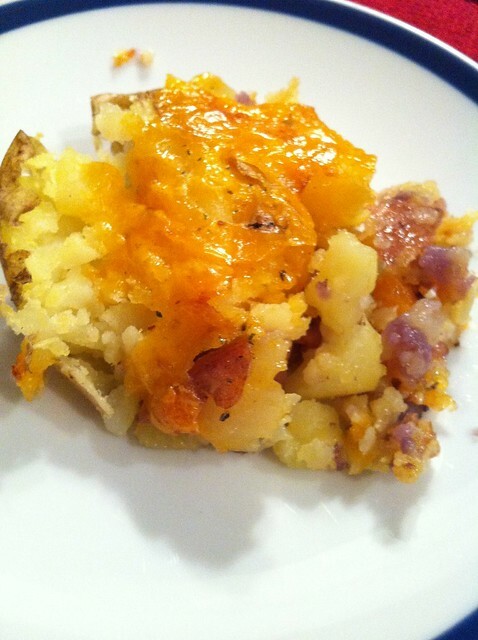 We’ve actually had “smashed” potatoes before but these look amazing with the cheese. Yum! You can also boil peeled garlic in with the potatoes. I do that most of the time when I make garlic mashed. Perfect inspiration for dinner tonight paired with ham steaks and steamed carrots!